Persistence Market Research analyzes the global dressing vinegar and condiments market in a new publication titled “Dressing Vinegar and Condiments Market: Global Industry Analysis and Forecast, 2016–2024”. This study provides data for 2015 along with a forecast for the period 2016–2024. The main objective of the report is to identify dynamics in the market and provide recent updates and insights affecting various segments of the global dressing vinegar and condiments market. To provide better understanding of the market, the report also includes an analysis of drivers, restraints and trends in all five regions namely, Asia Pacific, North America, Europe, Latin America and the Middle East & Africa, which influence the current market scenario and future status of the global dressing vinegar and condiments market over the forecast period. A section of the report discusses how the overall competition in the market is steadily increasing. It discusses various factors that are shaping internal as well as external competition in the market. Overall internal competition in the global dressing vinegar and condiments market is found to be comparatively high due to the continuously increasing number of major providers of these products in the global as well as regional markets. The report highlights the market share of the global dressing vinegar and condiments market by each of the product type segments including different dressing vinegar segments such as red wine vinegar, balsamic, white wine, honey, ginger, sherry, malt vinegar and others and condiments type such as vinaigrettes, seasoning sauces, sauces and dressings, and others. 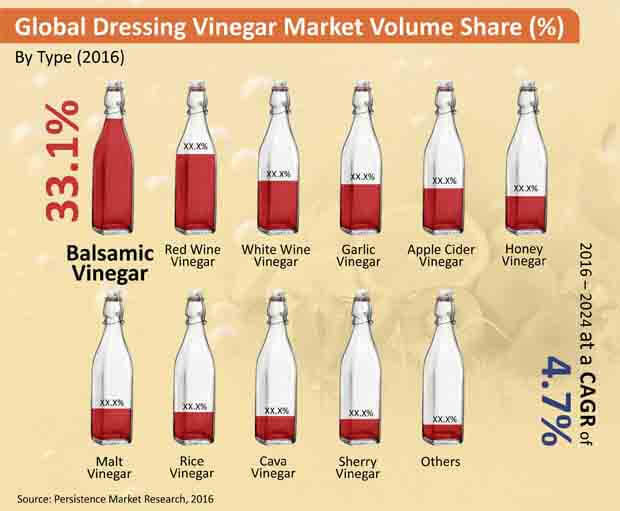 Another section of the report highlights the global dressing vinegar and condiments market drivers. It provides a market outlook for 2016–2024 and sets the forecast within the context of the global dressing vinegar and condiments market, including new product developments as well as product offerings in the global dressing vinegar and condiments market. This study discusses key regional trends contributing to the growth of the vinegar and condiments market globally, as well as analyses the degree to which drivers are influencing the market in each region. In the final section of the report, a competitive landscape has been included to provide report audiences with a dashboard view. Detailed profiles of some of the leading manufacturers are also included within the scope of the report to evaluate their long-term and short-term strategies, key offerings, product price range, SWOT analysis, and recent developments in the global dressing vinegar and condiments market. Yearly change in inflation rate has not been considered while forecasting market numbers. Top-down approach has been used to assess market numbers for each segment. Bottom-up approach has been used to counter-validate the segmental market numbers. Macroeconomic indicators such as food industry outlook and food and health supplement spending have been considered to arrive at the indicated market numbers. The report not only conducts forecasts in terms of CAGR but also analyzes the market on the basis of key parameters such as year-on-year (Y-o-Y) growth to understand the predictability of the market and to identify the right opportunities across the global dressing vinegar and condiments market. Also, another key feature of this report is the analysis of all key market segments in terms of absolute dollar opportunity, traditionally overlooked while forecasting the market. However, absolute dollar opportunity is critical in assessing the level of opportunity that a provider can look to achieve, as well as to identify potential resources from a sales and delivery perspective in the global dressing vinegar and condiments market. In terms of volume, the global dressing vinegar and condiments markets are anticipated to expand at a CAGR of 4.7% and 2.1% respectively during the forecast period, and are expected to reach 165,977.4 MT and 147,694.7 MT respectively by 2024 end. All the product type segments in the global dressing vinegar and condiments markets are expected to expand at a significant CAGR over the forecast period 2016-2024. In 2015, the balsamic vinegar market segment was pegged at 36,710.5 MT and was estimated to reach 38,099.9 MT by 2016 end, reflecting a Y-o-Y growth rate of 3.8%. The market is expected to reach 54,771.9 MT by the end of 2024, registering a CAGR of 4.6 % in terms of volume over the forecast period. In 2015, the apple cider vinegar market segment was pegged at 8,685.6 MT and was estimated to reach 9,061.3 MT by 2016 end, reflecting a Y-o-Y growth rate of 4.3%. The market is expected to reach 13,426.6 MT by the end of 2024, registering a CAGR of 5.0 % in terms of volume over the forecast period. In 2015, the white wine vinegar market segment was pegged at 9,672.8 MT and was estimated to reach 10,046.0 MT by 2016 end, reflecting a Y-o-Y growth rate of 3.9%. The market is expected to reach 14,296.6 MT by the end of 2024, registering a CAGR of 4.5% in terms of volume over the forecast period. In 2015, the rice vinegar market segment was pegged at 4,903.6 MT and was estimated to reach 5,112.4 MT by 2016 end, reflecting a Y-o-Y growth rate of 4.3%. The market is expected to reach 7,539.4 MT by the end of 2024, registering a CAGR of 5.0 % in terms of volume over the forecast period. In 2015, the red wine vinegar market segment was pegged at 21,078.2 MT and was estimated to reach 21,941.2 MT by 2016 end, reflecting a Y-o-Y growth rate of 4.1%. The market is expected to reach 31,720.0 MT by the end of 2024, registering a CAGR of 4.7% in terms of volume over the forecast period. In 2015, the malt vinegar market segment was pegged at 5,588.1 MT and was estimated to reach 5,821.1 MT by 2016 end, reflecting a Y-o-Y growth rate of 4.9%. The market is expected to reach 8,540.7 MT by the end of 2024, registering a CAGR of 5.5% in terms of volume over the forecast period. Increasing demand for dressing vinegar is anticipated to drive growth of the global dressing vinegar market. In 2015, the North America dressing vinegar market was pegged at 20,165.0 MT and was estimated to reach 20,875.7 MT by 2016 end, reflecting a Y-o-Y growth rate of 3.5%. The balsamic vinegar segment is expected to remain the dominant segment in the North America dressing vinegar market over the forecast period. In 2015, total dressing vinegar consumption in Europe stood at 53,847.1 MT, which is expected to increase to 80,010.6 MT by 2024 end. Growing demand for vinegar owing to its associated health benefits is expected to drive the growth of the Europe dressing vinegar market during the period of assessment.